The All Cotton Toddler Mattress: This handmade in the USA all cotton toddler mattress is a great alternative to traditional toddler mattresses. As you may know, traditional mattress manufacturers use many harmful chemicals in their mattresses. 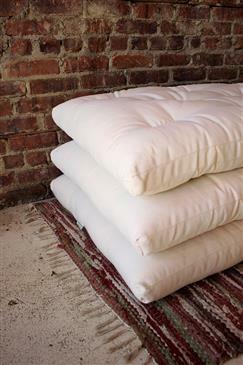 This toddler mattress is made of US grown cotton and it includes a sturdy cotton case. This toddler mattress comes without borate and can only begin production upon receipt of your doctor's prescription. This mattress is semi-firm. The Cotton and Wool Toddler Mattress: We also call it the Dreamton. You can buy a Dreamton style Toddlers Mattress to avoid the borate or the need for a doctor's prescription. Our dreamton mattresses have wool as the outer most layer. The wool acts as a natural fire retardant and you do not need a doctor's prescription to order one. This mattress is semi-firm. The Pure Cotton and Wool Toddler Mattress: This mattress is just like the Cotton and Wool described above but the main difference, is that the cotton is USDA and GOTS Certified Organic and the outer fabric is also 100% Organic Cotton. All of these toddler mattresses fit in a crib frame and offers a safer nights sleep. Organic Cotton Toddler Mattress ∙ 28x54x3.5” ∙ approximately 22 lbs. Green Cotton Toddler Mattress ∙ 28x54x3.5” ∙ approximately 26 lbs. Every parent or parent-to-be needs should read these documents: a letter to Mothering Magazine on the relationship between SIDS and conventional cribs versus natural cribs, a detailed explanation of the cribs and "The Ultimate Guide To Baby Sleep Safety And SIDS Awareness." At what age can a chile begin to use this mattress safely? This mattress can only be used for a child that can easily lift up their head and sit up. No infant should use this mattress. how heavy is this mattress?